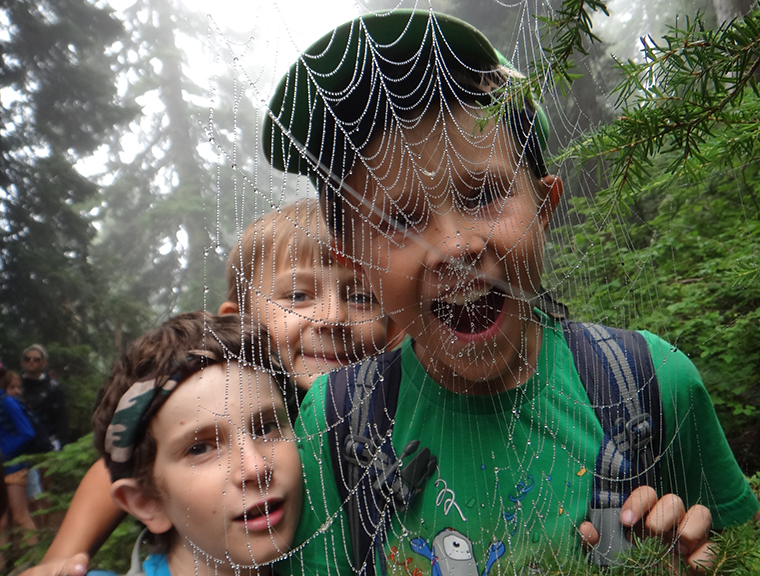 Mt Seymour's Eco-Adventure Camps offer experiential summer programs for kids, aged 5 to 14, that incorporate fun, education, self-awareness, skill development, and meaningful connections to the environment. Programs have ratios of 2 instructors to 14 children, the lowest of the North Shore Adventure Camps, and take place on the top of Mt Seymour – the perfect location for the ultimate nature experience! At Mt Seymour, we believe that nature is an essential ingredient in the healthy development of all children; fresh air is good for everyone! We re-introduce kids to a simpler, more connected way of life where they are encouraged to engage their senses to the fullest and learn by participation. Your kids will come home tired, muddy, and brimming with exciting stories from the day! Each TrailBlazer, Forest Guardian and Mountain Ranger registrant will receive a Promotional 2019-2020 Mt Seymour Season’s Pass so they can hit the slopes next winter! Youth Leadership registrants will receive the value of a child’s pass towards a youth pass! A Mt Seymour water bottle, keeping the little ones hydrated is a big deal to us! Our programs are unique and immersive. Now in our 10th year, we continue to build a community of healthy, responsible, and caring children through thoughtful and intentional programming. Our camp activities are different from many other camps agendas. Rooted in the cultural and environmental practices local to our mountain, campers gain a strong sense of place and of belonging in the local natural world. We are honored to operate in beautiful Mt Seymour Provincial Park within the ancestral, traditional, and unceded Aboriginal territories of the Coast Salish Peoples, in particular, the Tsleil-Waututh Nation and Squamish Nation, on whose territory the mountain stands. Mt Seymour boasts old growth forest, lakes, streams, wildlife and a diverse trail system it really is beautiful up here. No need for out-days or extra camp time on the bus, from basecamp we can go explore a new and amazing spot each day on our own two feet. Your kids might come home with some hiking recommendations! We’re a small, dedicated, nature nerd team with a 1:7 participant – instructor ratio. Our instructors are experienced, mature, and undergo 10 days of intensive pre-camp training, many camps only do 2 days. They are also safety focused and lovvvve the outdoors. Additionally, we require all instructors to undergo a criminal record check and be certified in First Aid. They are also all employees; we have AMAZING volunteers, but unlike many other summer programs we do not include volunteers in our participant to instructor ratios. Shuttle Bus with 3 Pick-up / Drop Off Locations. We make getting to the mountain easy with a shuttle bus. This summer we have adjusted the shuttle times for greater convenience and efficiency. Season Pass, Cool Camp Water Bottle included. This summer, every participant will receive a complimentary 2019/2020 Child Season Pass (age 5-12) to Ski next winter! We are also including a logoed, bpa free, water bottle in registration. Youth participants age 13+ will receive $99 discount off the purchase of a 2019/2020 Youth Season Pass. The complimentary Season Pass cannot be used in conjunction with any other deals or promotions, has no cash value, and is non-transferable. You can opt out of this promotion however this does not change the price of the camp. If you have already purchased a 2019/2020 Season Pass for your child/youth, please call Guest Services 604.986.2261 to make your camp purchase. We are proud to offer a technology-free and commercial-free nature immersion camp experience; no Ipads, video games, trading cards or netflix! Kids will develop practical skills and confidence through guided challenges and discoveries while developing a deep appreciation of the great outdoors.